Sony ZX1 Walkman UK price and release date confirmed | What Hi-Fi? Sony has confirmed its flagship high-resolution audio Walkman, the NWZ-ZX1, will be coming to the UK. The Walkman, which we first spied at IFA in Berlin last year, is due for release this February and will come with a price tag of around £550. Officially announced at CES 2014, the Walkman joins other high-res audio music players announced at CES, such as the Astell & Kern AK240. You can read our first impresions of the ZX1 in our hands-on review and we will be bringing you an exclusive review of the finished UK product very soon. We originally spotted the new NWZ-ZX1 at IFA, amongst the new family of Sony high-resolution hi-fi products. 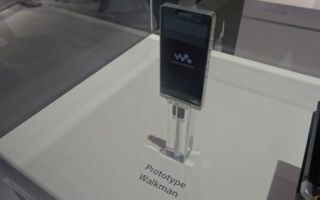 Alongside the officially-announced high-res Sony Walkman F886 – which sports WiFi and the Android OS for apps, web browsing and more – was a product simply labelled "Walkman Prototype". Well, we now know that product is the Sony NWZ-ZX1, an Android-toting, high-res supporting, 128GB high-res music player. According to the specs, it features a 4in FWVGA (854 x 480 pixel) LCD display, NFC, wifi and Bluetooth. Audio file support includes 24bit/192kHz, Apple Lossless (ALAC), FLAC, WAV and AIFF. Needless to say at IFA, Sony assured us this flagship Walkman would sport sophisticated internal circuitry and other top grade audio components for optimum sound quality. The ZX1 has a leather-effect rear casing as well as a notable bump in the profile, which Sony claims "improves holding comfort" and "holds all the key components for improving sound quality". While we can't vouch for the feel, the aluminium edge on the design did look smart, with a simple Sony logo and the odd flash of colour to brighten the display. Also on display at IFA was a prototype headphone amp, the PH-A2, which could possibly be portable, though this wasn't confirmed. It's clear that Sony is serious, once more, about high-resolution audio, and with the LG G2 phone and Samsung Galaxy Note 3 being released with high-res support, it seems they're not the only ones.